Meningeal worm is a parasite that affects alpacas. Read the questions and answers below to become informed about this parasite. A parasite whose natural host is the white-tailed deer. How does my alpaca get m. worm? First, you must reside in an area where white-tailed deer exist. Eggs hatch in a deers lungs. The larvae are coughed up and swallowed by the deer. The larvae are then passed to the feces and excreted onto the ground. The larvae find an intermediate host in snails and slugs. Your alpaca ingests the infected snail or slug. Once the larvae are in the stomach, they penetrate the stomach wall and enter spinal nerves. Then they travel to the spinal cord or brain. What are the symptoms of meningeal worm infection? Some of the symptoms seen might be: Rear leg weakness, lameness, uncoordinated gate, stiffness, paraplegia, paralysis, circling, abnormal head tilt, blindness, gradual weight loss, inability to eat. Can m. worm kill my alpaca? Yes. Damage to the central nervous system can be severe enough to cause death. How is the parasite detected? There is no definitive way to detect it in a live animal. Symptoms and lab values are used to diagnose m. worm. How is m. worm treated once an alpaca is infected? Usually, some type of dewormer is used to kill the parasite. Steroids and anti-inflammatories are used to prevent inflammation and swelling from damaging the spinal cord. Supportive care is, also, used in the form of physical therapy. Keeping blood flow to muscles by massaging helps keep them healthy and allows the animal to recover better. Will my alpaca recover completely? Depends on how much damage was done. Once the larvae migrate into the nervous tissue, any damage that occurs is usually irreversible. Can an infected alpaca pass the meningeal worm to other alpacas? Your alpaca must ingest an infected snail or slug to get m. worm. Alpacas are considered a dead-end host. The larvae in alpacas do not mature and produce eggs that mature into larvae that pass out of the animal. They stay in the central nervous system. How do I prevent meningeal worm in my alpacas? Prevention is the key. The current practice has been to give a dose of Ivermectin every 30 days to alpacas in areas with white-tailed deer. However, overuse of Ivermectin has resulted in increasing drug resistance among parasites in alpacas. Work with your vet. Your worming program should be tailored to your individual farm and geographic area. 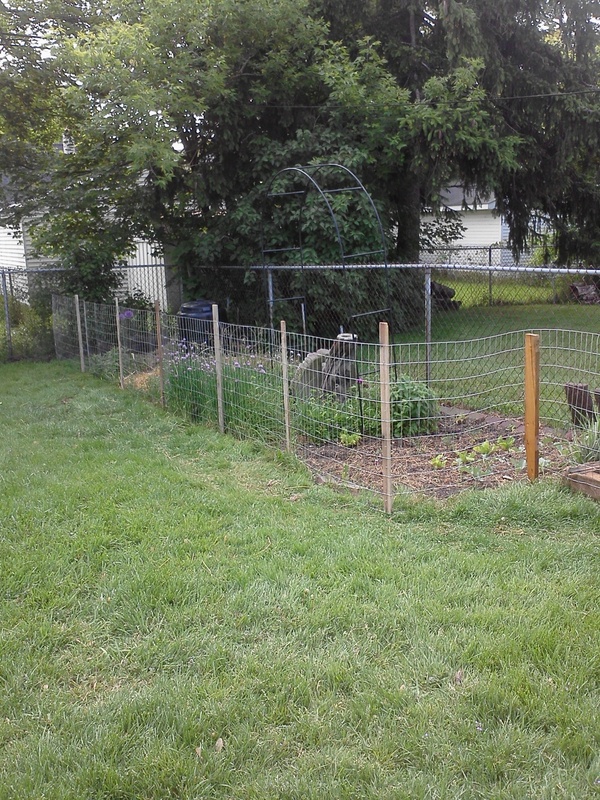 You can put up a deer-proof fence with a gravel or paved area along the outside of the fence to attempt to keep snails and slugs out of your pastures. This is expensive. You can use a molluscicide, but it might be poisonous to your alpacas, so be careful. Your vet will have up-to-date information to prevent meningeal worm infections. One other method of prevention is to keep Guinea Keets free-ranging in your pastures. They are fabulous bug eaters and they’ll eat the snails/slugs that could infect your alpacas. 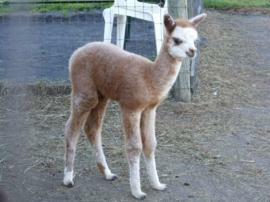 Here is “Rose Shadow’s Stars and Beyond’s” new boy cria! Once again, a big Congratulations to Steeple View Alpacas! He’s gorgeous! It’s time for a quick GIVEAWAY! All you have to do is guess what my favorite breed of chicken is by leaving a comment. Hint: I may or may not have this breed. Winner will be randomly chosen from all correct guesses and announced tomorrow morning. You have until midnight tonight (EST) to get your guess in. 1 guess per person, make sure to include your name and your email so we can easily notify you if you’re our winner. And….just to make it a little more fun, we are going to keep the prize a secret!!!! Hint: it’s something that is both simple and cute! 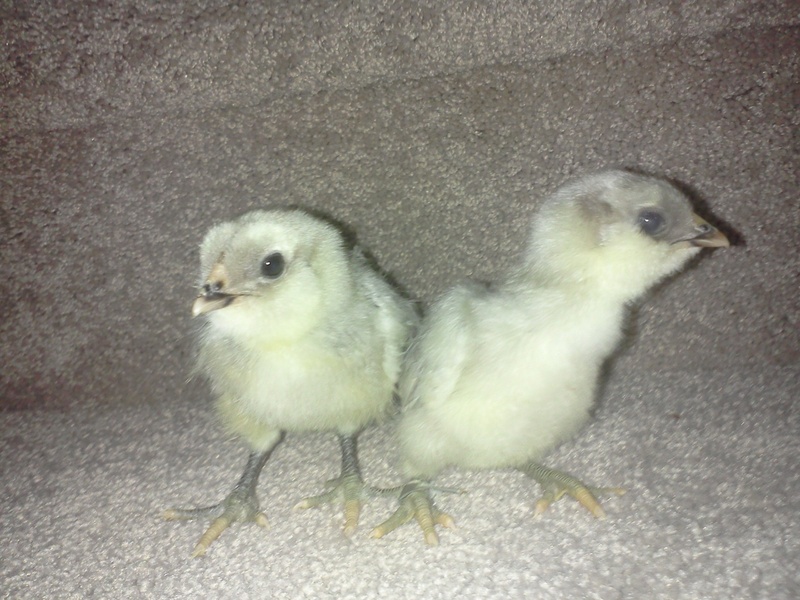 Yesterday I couldn’t help myself and had to buy 2 of my favorite breeds, a Lavendar Ameraucana and an Olive Egger. I’m hopeful they are both girls and they need names! Please feel free to give us your suggestions. So there’s been a lot of talk these days about recycled wood pallets and how you can use them in and around your home. I wanted to share with you a couple ways we have recycled wood pallets. We also used a wood pallet to make garden stakes to hold up the welded wire fence around the garden. My hubby simply took a pallet apart and made stakes using a table saw. There are so many uses for old wood pallets. If you’ve recycled wood pallets, please leave us a comment on how you used them and share a picture too. Hope everyone had a lovely Mother’s Day, I got so caught up in festivities I lost track of time! My apologies for the late announcement of the winner of our Mother’s Day CONTEST. and the WINNER is……..ANNE from THIS OLDE FARM!!! Congratulations Anne!!!! Please email your mailing info to roseshadowranch@yahoo.com so we can get your prize mailed out to you! Thank you to everyone who participated in the contest! A new one is already brewing so stayed tuned, you could be our next lucky winner! Happy Mother’s Day to all you Mom’s out there! Whether you have “human” children or a farm full of furry and/or feathered children, it’s your day! REMINDER: Our Mother’s Day CONTEST ends tonight! So don’t miss out on your chance to win our one of a kind handmade prize! Click on the CONTEST tab for more info, and good luck everyone!!!! Just a reminder, our CONTEST ends on Mother’s Day, Sunday May 13th at 7:00pm! There’s still time for you to get in on a chance to win a really great prize! Click on the CONTEST tab to get the details. Good luck everyone!